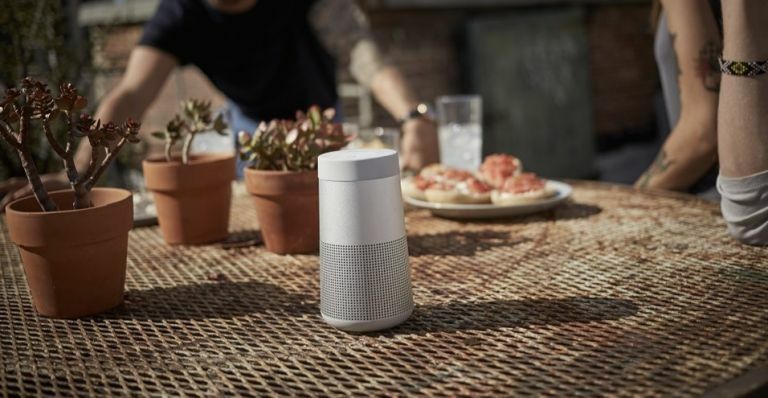 Audio powerhouse Bose has just unveiled what could be its best Bluetooth speakers ever - the new SoundLink Revolve and SoundLink Revolve+. With true omni-directional performance, and an entirely new acoustic design, Revolve speakers spread deep, jaw dropping sound in every direction. They combine dual-opposing passive radiators with a powerful, ultra-efficient transducer and a new patented acoustic deflector. With an added “pressure trap” to eliminate distortion, the result is dramatic and powerful wave of sound that doesn't need to be pointed in any particular direction to spread its audio. SoundLink Revolve models also feature an IPX4-rating to withstand spills, rain and pool splashes, as well as a rugged durability to survive knocks, drops, and bumps. A quarter-twenty thread on the bottom of each makes for easy mounting on a tripod for listening in the garden or an outdoor party. The SoundLink Revolve and SoundLink Revolve+ Bluetooth speakers are available for pre-order now for £199.95 and £279.95, respectively, and come in two colours – Triple Black and Lux Grey. French cookware and small appliance maker Tefal has just launched a brand new Fasteo range, which upgrades the regular steam iron to tackle large loads of ironing, save time and give you faultless results. There are two steam generators in this range - The SV6020 (£139.99) is deep purple and the SV6040 (£159.99) comes in navy blue, available from Amazon, John Lewis, Home and Cook and other major retailers. The Fasteo has a large 1.2L water tank so you don’t waste time refilling during sessions, it heats up in two minutes and has a powerful steam output that removes the most stubborn creases with ease. The Fasteo even comes with two filter cartridges that help to prevent limescale build up, which not only keeps your clothes free of dirty water but also ensures that there is no loss of steam power. British projector specialist Pico Genie has just launched another new portable model that's packed an impressive array of features into its compact form. The Pico Genie M550 Plus is a smart LED projector that offers 650 lumens, a three-hour battery and an Android OS, while still being ultra-portable size. It’s also short throw, which really sets it apart from other similar portable projectors on the market. That inclusion of Android 4.2 OS (new models will use 4.4) makes a huge difference, since the interface is identical to that of an Android tablet. The projector also comes with a portable wireless keyboard and touchpad and can be used just like an Android TV Box or an Android tablet (just one that also happens to be a high-spec short throw projector). You can order a Pico Genie M550 Plus today for only £599.99 from most projector retailers, including here at Personal Projector.